Place potatoes in medium saucepan; add enough water to cover. If desired, add small amount of salt to water. Bring to a boil over medium-high heat. Cook 8 to 10 minutes or just until tender. Drain. Cool potatoes 30 minutes. 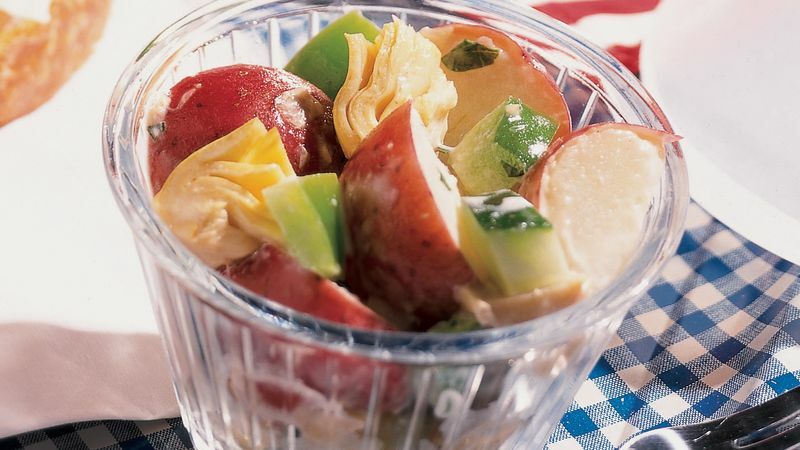 In refrigerator storage bowl, combine cooled potatoes and all remaining ingredients; mix gently. Cover; refrigerate at least 2 hours to blend flavors. Marinated artichokes are packed in a mixture of oil, vinegar and herbs. The marinade flavors this easy potato salad. Bring to a picnic only the amount of this salad you’ll eat, since chilled food toted in coolers will only stay fresh for the day. Leave the rest at home, refrigerated in a covered container to enjoy another day. Add 4 ounces crumbled feta cheese for added flavor and texture.